While we have some fun plans this week (a Yankee game with our friends Tom and Sharon on Sunday and tickets to see “Hamilton,” Lin-Manuel Miranda’s bold new musical about the founding father and first Secretary of the Treasury, followed by dinner at El Original on Saturday), aside from what will probably be a slightly busier-than-usual work week, we should have plenty of time to cook. So, we’ve picked out four new recipes to try. 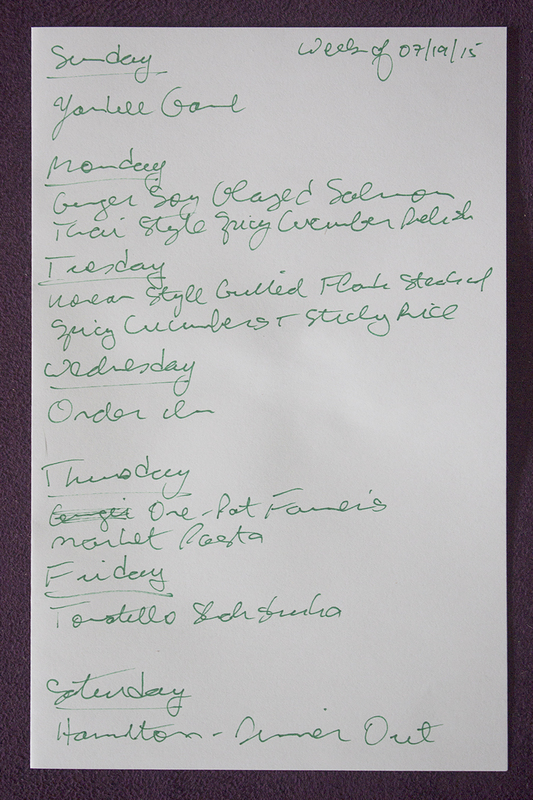 We’ll probably order in on Wednesday night, but on Thursday night, we’re going to indulge Tony’s recent obsession with one-pot pasta dishes. Last week, we made Martha Stewart’s One-Pot Pasta and despite our concerns going in, it was great. We’re trying a new recipe, from a blog that we found just this week: The View from Great Island. The recipe is for One Pot Farmer’s Market Pasta and includes a lot more veggies–like asparagus, broccoli, and bell pepper among others. We’re even more curious to see how this dish turns out, since there will be a lot more in the pot, but less water than the other recipe (3 1/2 cups versus 4 1/2 cups). On Friday night, we’re making Tasting Table’s Tomatillo Shakshuka. We’ve made a version of this dish before using plum tomatoes, which was delicious. Having made the “red” version, we’re excited to make the “green” version. We may have another Queens dining adventure in us, so we may go out for dinner Friday night, but if we do, we’ll just make the shakshuka for lunch on Saturday. We have two pound of tomatillos in the fridge, so one way or another, this dish is getting made! I want to hear about the karaoke!